More than 2.4 million people have signed letters calling on the U.S. Federal Communications Commission to stop its proposed “takeover” of the Internet in an effort by conservative activist group American Commitment to reframe the debate about the agency’s proposed net neutrality rules. American Commitment’s letters and petition page do not refer directly to net neutrality, however. Instead, the group’s materials call on the FCC to refrain from regulating the Internet and from taking over the Internet. The group said that it delivered the 2.4 million letters, urging Congress to stop the FCC’s net neutrality proceeding, to lawmakers this week. The group’s online petition at StopInternetRegulation.org doesn’t mention the words “net neutrality” or “open Internet,” the FCC’s term for the proposed rules. There’s nothing in the FCC’s proposed rules that would amount to a federal takeover of Internet content. Net neutrality rules, even if the FCC reclassified broadband as a regulated public utility, also wouldn’t amount to the U.S. government taking control of broadband networks, although they could allow the FCC to regulate network management practices. While the petition doesn’t mention net neutrality by name, it’s an honest summation of the issue, Kerpen said. 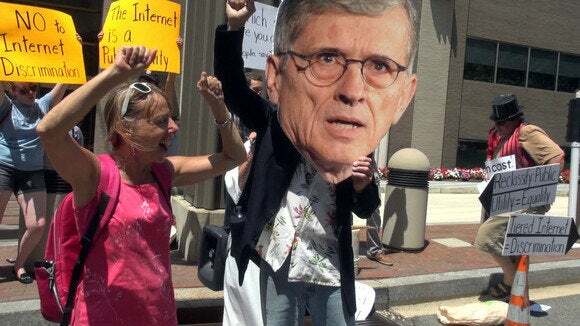 Many net neutrality advocates like Free Press have called on the FCC to reclassify broadband as a regulated public utility and, if that happens, it would amount to a federal takeover of the Internet. American Commitment’s letters won praise from Representative Greg Walden, an Oregon Republican, and critic of the FCC’s proposed rules. “It is important for these Americans from across the country to be heard loud and clear,” he said in a statement.